Bruins Could Really Use…Sean Kuraly? The Boston Bruins skated off the ice at Scotiabank Arena last night, left to lick their wounds and contemplate what it will take to recapture the momentum in their best-of-7 opening round playoff series with the Toronto Maple Leafs. Much of the attention following the loss was focused on the lack of production from the top-line trio, Patrice Bergeron, Brad Marchand, and David Pastrnak. Having opened up last year’s opening round series with a combined 20 points in the first two games at TD Garden, the line has only managed to amass a combined 6 points through three games in the series. With much of the fan base and media speculating that the answer is now to split up the top line by moving Pastrnak down to David Krejci’s right wing, a close look at some of the indicators through three games suggests the Bruins true woes may be found a lot further down the lineup. One of the Bruins strengths in the regular season was the relatively effective play of its fourth line, a line that when healthy features Sean Kuraly centering Noel Acciari and Chris Wagner. Kuraly went down with a hand injury suffered on a blocked shot in a game against the New Jersey Devils on March 21st. The Bruins had indicated that Kuraly was expected to miss at least 4 weeks with the injury. 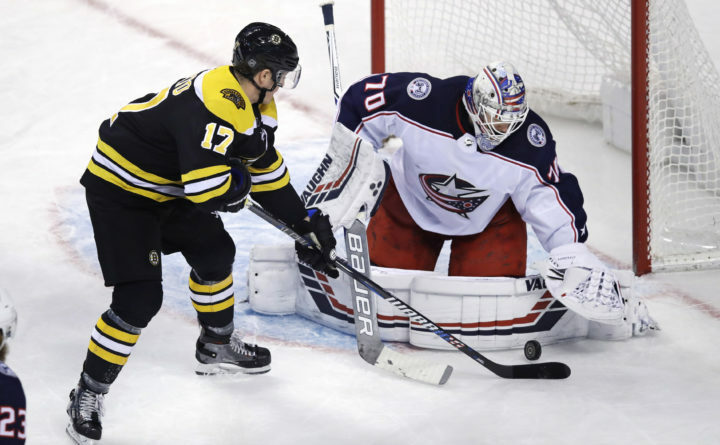 As the Bruins made their way through the regular season and skated to the second best record in the Eastern Conference, they were buoyed by the solid play of their fourth line. Often sent out to match up against the opposition’s top line, the Kuraly line has proven particularly effective at hemming opposing teams into their own zone, being strong on the puck and providing valuable wear and tear on opposing defense corps. In turn, by spending their shifts 200 feet from their own goal, despite often starting in the defensive zone, they were effective in neutralizing opposing scoring threats while creating favorable matchups for the Bergeron line. With Kuraly currently sidelined, that line now finds Acciari centering Wagner and Joakim Nordstrom. Through three games of the current series against Toronto, the play and effectiveness of the so-called fourth line have been highly effective in Boston’s Game 2 win and far from it in their two losses. One indicator of a player’s effectiveness (I won’t debate the merits of the metric here, but it is generally accepted as a reasonable measure despite some limitations) is his Shot Attempts Percentage (SAT%, also known as Corsi). The SAT% is the percentage of shot attempts that the team takes out of total shot attempts. The calculation of SAT% = SAT For/(SAT For + SAT Against). As a general indicator players are looking to be above the 50% mark in this metric, considered to be above average. As mentioned there are limitations but generally speaking, the indicator is reliable. A look at this analytic through three games in the series tells an interesting story about the Bruins fourth line. Nordstrom’s regular season SAT% is slightly higher than that of Acciari, Wagner, and Kuraly and this is attributable to his having played further up the line up for much of the season and a higher percentage of offensive zone starts. Nordstrom starts in the offensive zone for 49.17% of draws compared to the others taking only about one-third of their draws in the offensive zone, averaging 34.51% between them. Starting shifts in the offensive zone gives a greater chance of accumulating shot attempts for, hence their effect on this statistic. So What Does It All Say? In a nutshell, the Bruins success in Game 2 was in direct correlation with the effectiveness of the fourth line. Coach Cassidy’s decision to start them against the Tavares, Marner, Hyman line had Maple Leafs Coach Mike Babcock pulling his line from the ice in the opening seconds and setting a tone that would have the game played on the Bruins’ terms all night. The Corsi numbers for the Boston’s fourth liners was off the charts in Game 2, Acciari at 64.3, Wagner at a mind-boggling 73.9, and Nordstrom at an above average 53.6. As a result, the Bruins exerted pressure on the Maple Leafs defense all game long, forced turnovers, and forced their best players to play far more in their defensive zone than they would prefer. By playing with the lead most of the night, all three players were able to log minutes in line with their regular season average. In Boston’s two losses in this series, however, the fancy stats are far less glamorous for the fourth line. In Game 1, Acciari was at 36.4, Wagner at 42.3 and Nordstrom at 43.5. The result as we all know was a game played very much on Toronto’s terms. The Maple Leafs were able to overcome an early deficit to play with the lead most of the night and used their highly publicized speed to create several breakaways and odd-man rushes that kept the Bruins chasing the game most of the night. In game three, the effectiveness of the fourth line was even worse. Acciari led the line with a SAT% of 30.4, Wagner was 27.6, and Nordstrom was 22.7. Those numbers are simply not going to get the job done. If the Bruins are going to be successful, I would argue that the key is not going to be breaking up the top line. Rather, they need a more effective contribution from the bottom of their forward group. If the fourth line can re-establish their identity as a hard-working, effective, forechecking group and force the Maple Leafs back into their own zone, effectively helping tilt the ice, the Bruins are going to be just fine in this series. The middle forward lines have been effective thus far, and you have to feel that the top line is not going to be held in check much longer, they are simply too good. A return to the line-up of Sean Kuraly would go a long way to getting the fourth line back on track. Kuraly combines speed and strength and a bull-like tenacity to hunt the puck and contain it. His energy is infectious and is arguably what has been lacking on the fourth unit in the two losses against Toronto. If the Bruins are to regain momentum and bring this series back to Boston on even terms, the fourth line needs to lift. It is unknown when Kuraly may return to the line-up, but he will unquestionably be a welcome addition when he does. In the meantime, the Bruins are looking for an effort reminiscent of the one provided in Game 2. Anything less and the return of Kuraly to the fold may be too little, too late. Playoff hockey. In Boston. Is there anything better? In case you think there is… here’s a collection of clips, links & social media shares to help change your mind just in time for the best time of the year for the NHL. Break out your Black N’ Gold, put on your favorite jersey and crank up the volume… it’s time to GET HYPED, BRUINS FANS! With the final game on April 6th, the Boston Bruins officially ended their 2018-19 regular season and now look ahead to the 2019 Stanley Cup Playoffs, starting Thursday, April 11th in their Eastern Conference Quarterfinals against none other than the Toronto Maple Leafs. The regular season was a long, winding roller-coaster for the Bruins. Injuries, droughts, streaks, and points were all in the recipe that created the story that was this season and somehow, the fans of the Black and Gold did not fall to the ground numerous times throughout this time due to the constant breath-taking events. Looking at face value, the Boston Bruins ended the 82-game season with 49 wins, 24 losses and nine more losses in post-regulation play. Their 107 points earned them the third spot in the entire league, behind the Tampa Bay Lightning who dominated with an incredible 62-16-4 record – winning the President’s Trophy and the Calgary Flames, who finished with same points as Boston, but managed to finish with three more regulation plus overtime wins (ROW). The Bruins scored the 11th most goals in the league, tallying a total of 257 goals for an average of 3.13 goals-for-per-game. On the other side of the puck, the goaltenders of Tuukka Rask and Jaroslav Halak helped the Bruins finish in the top 3 for least number of goals allowed in the entire season, allowing just 212 goals against, an average of 2.59 goals-against-per-game. More specifically, the Bruins trailed only the New York Islanders for least even-strength goals against (148). Specialty teams were one of the biggest strengths for Boston and they remain that way heading into the post-season. Boston concluded the ’18/’19 campaign with a 25.9% success rate on the power-play, the third best in the National Hockey League. However, the B’s did allow a league-leading 15 short-handed goals against, tied with the Pittsburgh Penguins. The penalty kill was not terrific for a top-3 NHL team, but that could also be due to the large mass of injuries to the blue line that hindered the defensive consistency of Boston. The Bruins have the 16th-best PK percentage, killing off just under 80% of the penalties they took. Regarding on penalties, the Bruins took the second-highest penalties-per-game, averaging 9.7 penalty minutes during the course of the season, behind only the New York Rangers. Even with all of the injuries throughout the regular season, the Bruins still managed to do quite well on an individual basis as many skaters and goaltenders set new career-highs and played some of the best hockey of their NHL career. Players that are included within the following section are players that are likely to play in the first-round series or have had an impact on the team. AHL players and some rookies, as well as traded players, will not be included. Brad Marchand, David Pastrnak, and Patrice Bergeron all set new career-highs in almost every category and that line proved that even with the absence of some of them, can produce at a high-level and they are truly one of the best lines in all of hockey today. Below that, David Krejci assisted on 53 goals and Jake DeBrusk nearly hit the 30-goal mark. Both of those two can add some much-needed depth scoring in the playoffs. Trade deadline acquisitions of Charlie Coyle and Marcus Johansson have not been as amazing as may be hoped, but both have had to deal with a brand new system and brand of hockey in addition to Johansson missing games due to a lung contusion. Forward Karson Kuhlman has been great, scoring five points in eleven games and has been reliable for replacing the injured forwards on the roster. The devastating injuries ran hard through the defensive core of the B’s, forcing the club to use twelve different defenders throughout the year, with only one of them playing more than 70 games (Brandon Carlo – 72GP). Even heading into the best-of-seven series against the Maple Leafs, the Bruins will be without John Moore and Kevan Miller for a good portion of the series. Torey Krug has been what he has been for the last few years – a good offensive defenseman that is deadly on the power-play. Krug is the quarterback of the Bruins man-advantage and he knows how to feed the forwards on the ice, a characteristic represented by his 47 assists on the season. Other than that, when the players have been healthy and on the ice, they have been pretty good for the most part. It seems that health will be the biggest deciding factor for the Bruins’ defense versus Toronto. I recently wrote an article on the Black N’ Gold Hockey website about the work of Tuukka Rask and Jaroslav Halak and how the combination of the two could be the biggest advantage that the Bruins have against the Leafs for the postseason series. You can check out that piece HERE. Both Rask and Halak have statistics in the top ten of the league in all of the main goaltending categories including goals-against-average and save percentage. While Tuukka is the deserving starting man in between the pipes, Halak is a great second option if the play of Rask falters at all throughout the series. With one win shy of 50 wins on the season, the Boston Bruins picked up victories over every single team in the NHL except for two – the Winnipeg Jets and Vancouver Canucks. Other than that, the Bruins had at least one victory over everyone, with some of them being clean season series sweeps. Boston won the season series over the Ottawa Senators (4 games), New York Islanders (3 games), Vegas Golden Knights (2 games), San Jose Sharks (2 games), Minnesota Wild (2 games), Los Angeles Kings (2 games), Chicago Blackhawks (2 games), Arizona Coyotes (2 games), and the Anaheim Ducks (2 games). Boston found success over the St. Louis Blues, Edmonton Oilers, Dallas Stars, Buffalo Sabres and the Toronto Maple Leafs, sealing 75% of the possible points in the season series when it was all said and done. In fact, Boston ended the season matchups with four of the five other Original Six franchises with an above .500 point percentage, with only the Detroit Red Wings beating Boston in the four-game series in 2018-19. The Boston Bruins scored the majority of their goals in the second period, tallying 93 total goals in the middle twenty minutes. Aside from that, they allowed the most goals in the third period (79). When the B’s managed to score the game’s first goal, they found great success, finishing the season with a 34-7-5 record. Looking at the other side of the coin, Boston had a 15-17-4 record when the opposing team scored the first tally of the contest, something to be noted heading into the playoffs. Without further ado, that is the entire 2018-19 NHL regular season all wrapped up and finished. The Boston Bruins begin their road to their first Stanley Cup since 2011 Thursday night against the Toronto Maple Leafs in the TD Garden in Boston, Massachusetts. For a full preview on the best-of-seven series, check out fellow BNG Site writer, Yanni Latzanakis’ article HERE. The boys in Black and Gold are back home playing their final season matinee game against the Tampa Bay Lightning. With a win this afternoon, Boston can notch their 50th win for the second consecutive season and 11th in club history. The Bruins have won their past two games and both teams have punched their way into the Playoffs. Boston defeated the Minnesota Wild this past Thursday, in which fans got to see the NHL debut of Providence’s Zach Senyshyn, who would go on to notch his first NHL goal. The Bruins are now at 107 points, tied with the Calgary Flames in the league and locked at finishing second in the Atlantic Division. The top line continues to dominate as all three players have tallied up points to lead the team, as well as being in the top five in the league. Brad Marchand is fifth in the league with 100 points; Patrice Bergeron is fourth in the league with four short-handed goals; David Pastrnak is fourth in the league for power-play goals (four). Marchand leads the team in points (100) and assists (64), while Pastrnak leads the team with 38 goals. The 22-year-old Czech forward has also accumulated 13 points in his last eight games played. Jake DeBrusk has six points in the last five games played, while David Krejci has seven in his last five games played. Defenseman Torey Krug has notched five points in his last five games. Charlie Coyle will be playing his 500th game in his NHL career. Marchand has eight points in the last five games played. The Tampa Bay Lighting come into the TD Garden looking to nab the NHL record for most wins in a single season. Tampa Bay has 61 wins and is within one win away from tying the Detroit Red Wings record of 62 wins back in 1996. Forward Nikita Kucherov is one point away from tying Alexander Mogilny record of most points in a single season. Kucherov has 126, while Mogilny has 127–the most by a Russian-born player. Kucherov leads the team in points (126) and in assists (86). Fellow teammate Steven Stamkos leads the team with 44 goals. Kucherov leads the league in both points and assists; Stamkos is second in the league with 19 powerplay goals and has 16 points in his last nine games. The Lightning have a regular season record of 61-16-4 while the Bruins are 49-23-9. The Bruins rested many players on Thursday, but some could return today. Defenseman Kevan Miller sustained a lower-body injury on Thursday but is expected to play this afternoon. Expect goaltender Tuukka Rask in net today and for the Lightning expect Andrei Vasilevskiy in between the pipes. Chris Wagner is still nursing a lower-body injury, John Moore has an upper-body injury and Sean Kuraly is still recovering from hand surgery. For Tampa Bay, Dan Girardi, Victor Hedman, and goalie Louis Domingue are all nursing injuries. “Huh?” is exactly right. But, then I started thinking about it… or more accurately more astute journalistic minds starting thinking about it, and commenting on my social media about it, which in turn turned my thoughts about it to have an about face. How many of those points were scored for the Bruins? A valid point, indeed! Sure, the B’s have seen some of their top draft picks since 2003 — the first year of this draft study — score the majority of their NHL points for another franchise, namely Phil we’re-no-longer-thrilled Kessel & Tyler traded-too-soon Seguin. But, it’s still pretty impressive when you actually sit back and reflect on it, especially considering just how mercilessly the city, the media and the fans scrutinized Boston’s 21st-century GM’s for their lack of “draft success” on the whole (yes, we’re referring to you Mike O’Connell and Peter Chiarelli — and to more recent effect Dealin’ Donny Sweeney). To order up a serving of “Pasta” every time No. 88 scores a goal or notches an assist would be akin to heart failure. Thankfully, the deliciously nicknamed David Pastrnak impacts our ticker in many other ways — specifically, making it race with excitement & adrenaline whenever he touches the puck or skillfully skates around a deft defender. To wit: the B’s most recent “W” against the Rangers in which he had as many points as the number one star credit he was given postgame. Love or hate the recently unemployed “Chia” pet up in Edmonton, but you’ve got to give him credit (or at least his scouting team) for Pasta. Let’s keep those 5-point games on the menu! He’s the most productive pest in modern-day NHL history and he’s as big of a character as you’ll ever find in B’s history — and that’s saying something! 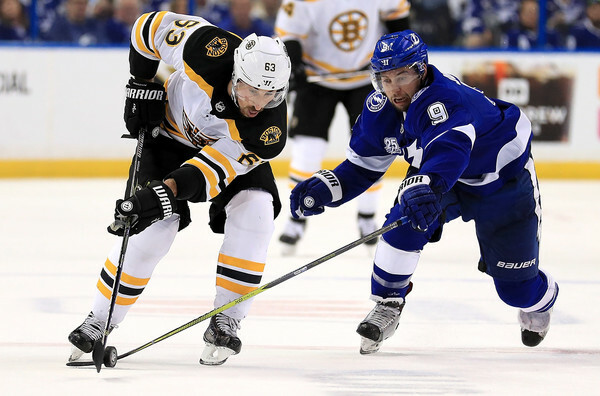 He’s Brad Marchand and he’s only just begun, to paraphrase a Carpenter’s classic (not to be confused with former Bruin Bobby Carpenter–another point-filled pugilist). And to think both Kessel and Milan Lucic preceded him in 2006 when interim GM Jeff Gorton was doing his damnedest to pry Nicklas Backstrom away from the Caps for every pick the B’s had! Would “Marchy” have been on that potential list? Who bleepin’ cares now is what I say. And to think… Twitter and Instagram weren’t even a part of Marchand’s life yet!!! The above video says it all: when you have a highlight reel gone viral because you had the most points in the postseason for your Stanley Cup-winning team, then you deserve plenty an accolade. Ironically, all David Krejci deserves right now is a 2nd-line winger who can consistently score ala David Pastrnak! Or, did we just see that recently? I digress. But, while on the subject of scoring, let’s not overlook just how invaluable the Czech center has been for the B’s since he was drafted more than a decade ago — ironman status included starting last season. Just think: if he keeps producing and playing alongside another popular B’s draft pick (Jake DeBrusk), then this point-filled list is going to need an update real soon! There’s a quiet grace about Patrice Bergeron that makes people forget exactly how good a player he is, and it’s unbelievable how long he’s been an important fixture in the Bruins’ lineup. 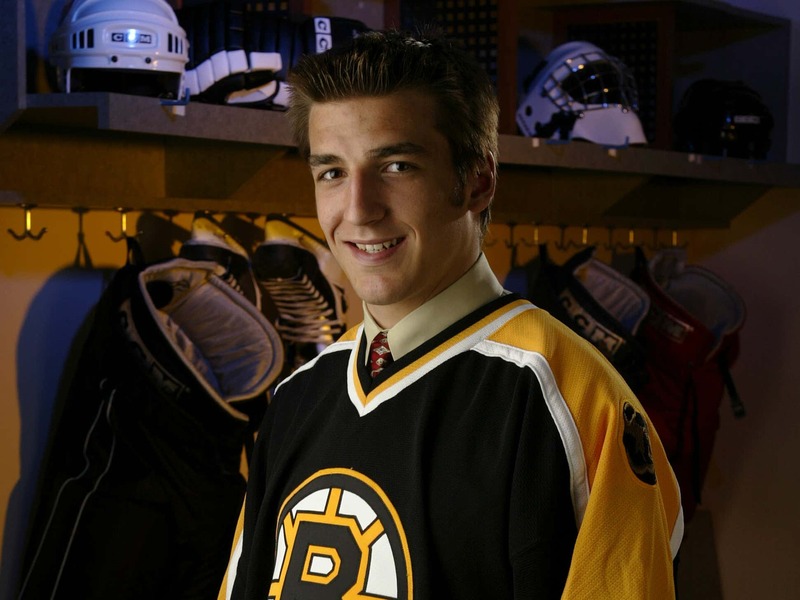 One of the best players in the world, Bergeron is a member of the Triple Gold Club (World Junior Championship, Olympics, and Stanley Cup), and a four-time Selke Trophy winner, as the National Hockey League’s best defensive forward. This is a player who is so consistently effective night in and night out, that the only reason any of the milestones he’s achieved as a Bruin have been remotely surprising is because it’s so easy to forget he’s been with the team for 15 years. Talk about a solid three years of drafting in the early oughts for the B’s! So, do you now measure the success of the Bruins’ modern draft machine a bit differently considering all of the above? Do also believe the team is only going to add to these impressive totals what with all the young scoring talent yet to emerge (aka on the cusp)? You do! Well, good. How Will The Bruins Fare In Round One Of The 2019 Stanley Cup Playoffs? With an overall record of 46-21-9, the Boston Bruins’ 101-point season thus far puts them in a tie with the Calgary Flames for the second-best franchise in the entire National Hockey League. An unexpected feat when the season began back in October, but this group of hard-working, tenacious players have battled through injuries, losses, and setbacks to be one of the best in the league today. If you were to track the Bruins’ progress throughout the season, you can see that they are now in the top three contenders for the Stanley Cup. They weren’t always in the top three so to see them where they are at now, it’s incredible. On Saturday, the Bruins officially clinched a berth in the 2019 Stanley Cup Playoffs with a 7-3 crushing of the Florida Panthers. With that said, it only further confirms that the Bruins and Maple Leafs will meet in the opening round of the playoffs for the second consecutive season. Do these two match up the same or will new history be created this time around? On paper, both teams have the skill to not only score a few goals but to score a lot of goals. On the Bruins, the top line of Brad Marchand, Patrice Bergeron, and David Pastrnak have such amazing chemistry together that it almost seems that they know the exact position of each other on the ice at all times. All three of them reached the 30-goal plateau this season, and all three of them are having some of the best seasons of their NHL careers. Following behind them, David Krejci and Jake DeBrusk also have chemistry together – to the point where they thrive off of each other, even though they are different players. Krejci tends to slow down the game and make smart, tape-to-tape passes to his teammate to set up a slick goal. To his left, Jake DeBrusk possesses a great shot with blazing speed and aggressiveness on the puck. Their two styles blend perfectly on most nights, and it has paid off. Although the Bruins have and continue to have issues with consistent scoring from their entire bottom-six forwards, they do have one of the best fourth-lines in the league today. So much so, that the Acciari, Kuraly, Wagner line has seen third-line minutes quite often during the year so far. The three members of that line drive on rushes, make aggressive plays on the forecheck and even lay a few hits on the opposing team as well. Statistically, the Bruins are in the top half in the league for most goals for, but if the injuries were not a factor throughout the year, that number would be a lot higher. With the offseason addition of John Tavares, the Maple Leafs are still a threat offensively as well. They are top five in the NHL for most goals for scored and they have depth scoring throughout all four lines. Mitch Marner leads the teams in points with 25-65-90 numbers in 76 games this season. The biggest threat may be the center position with Auston Matthews, John Tavares, and Nazem Kadri all down the middle. You have to expect that Tavares will try to be more dominant because it is his first playoff series with his new team and the playoffs are without a doubt the most important time to shine. Toronto has more depth and more consistent scoring the further down you go. Both Boston and Toronto have the power to score five or more goals in a single 60-minute game, and it creates a true challenge for the opposing defense and goaltending. However, on paper and statistically speaking, Toronto takes this category, but it is a very close one. The Boston Bruins have used an incredible twelve defencemen throughout the season thus far, compared to Toronto’s nine. Boston’s defense, when healthy, looks like Torey Krug, Zdeno Chara, Brandon Carlo, Charlie McAvoy, Kevan Miller, and either Matt Grzelcyk or John Moore. More often than not, however, we have not seen this blue line core 100% healthy. Out of those seven players listed for the Bruins, only one of them has a minus rating, (Torey Krug, -3), but Krug does have a team-high 48 points on the year from the back-end, and he is always a threat on the power-play. He is arguably one of the reasons why Boston currently has the third-best man-advantage success rate in the entire league and has been within the top five for the majority of the season. 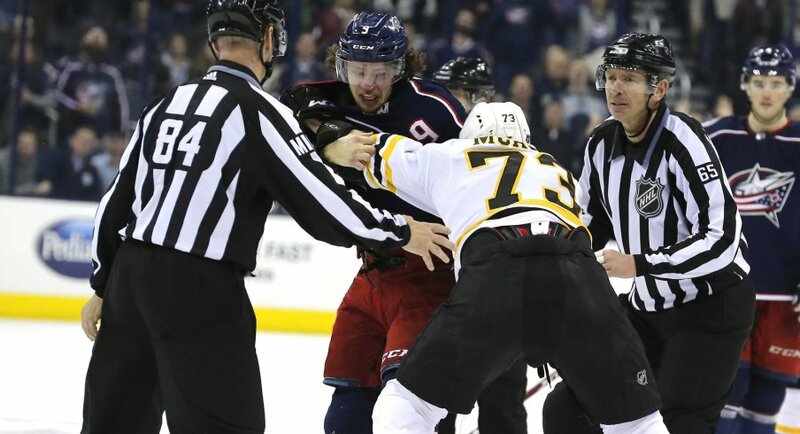 The B’s d-men possess some solid offensive talents with Krug, McAvoy, Grzelcyk, and Moore, but they also bring a solid toughness and physicality with 6-foot-9, 250-pound captain Zdeno Chara and 6-foot-2, 210-pound Kevan Miller. Between those two men alone, fear can be set among other teams in the NHL and has done so when they are together on the ice. Brandon Carlo can fit into the physical spectrum as well, but can also add some extra points when needed to. For Toronto, the defensive side of the puck has been a weakness for some time now, mainly due to the stacked offensive core that we have previously discussed. Morgan Rielly leads the defencemen with 20-48-68 numbers in 75 games played, followed by Jake Gardiner (29 points) and Ron Hainsey (22 points). That is great, and all, but the blueliners on the Maple Leafs have been a liability as some of the Bruins have as well. Nikita Zaitsev, Ron Hainsey, and Jake Gardiner have had their questionable moments in a game before, some of which Bruins fans will remember as well, (Gardiner’s mistake led to DeBrusk’s game-winning goal in Game 7 of the 2018 Playoffs). That was and continues to be a concern for the Blue and White. In January, General Manager Kyle Dubas traded for a d-man Jake Muzzin from the Los Angeles Kings, a move that made Toronto’s depth on defense a lot better. Muzzin has 5-11-16 numbers in 27 contests with the Leafs, averaging just over twenty minutes on ice per game. The Bruins allow an average of 2.48 goals-against-per-game, third in the league while the Leafs allow an average of 2.97 goals-against-per-game, 16th in the league. For that and the depth that Boston has shown with the injuries faced, the defensive side of the equation goes to Boston. The last of the three categories is the most crucial of them all. When all of the offense fails, and the two defenders on the ice cannot prevent the puck from advancing, there is only one man who can make a last effort to stop the puck from crossing the goal line – the goaltender. Last season, during the 2018 Eastern Conference Quarter-Finals, it was an intense battle between Tuukka Rask and Frederik Andersen. Although this season, times may be different. Boston has seen success with both Rask and offseason acquisition Jaroslav Halak, who could be a possible winner for the annual 7th Player Award. Boston Head Coach Bruce Cassidy has nearly split the games started between the two netminders with Rask starting 42 games and Halak starting 37 games before Monday’s game against the Lightning. Jaroslav Halak is fifth in the league for best goals-against-average (2.31 GAA) while Rask is 7th with a 2.35 GAA. The two are the second-highest ranked duo in the league, behind only Lehner and Griess on the Islanders. Rask and Halak are both also top fifteen in save percentage. Frederik Andersen has played 55 games this year and is 24th in the NHL for GAA (2.72), and 13th for save percentage (.918). Garret Sparks most likely will not get any starts in the playoffs as he boasts an 8-7-0 record with a 3.16 GAA and a .907 save percentage in 15 games started. Rask and Andersen have had issues in playoff scenarios before, but the hope for Boston is that if Rask does struggle, Halak can keep the team going, as he has done in the 2018-19 regular season. That in addition to the on-paper statistics being in favor of the Bruins, this category goes to Boston. In the four games against the Maple Leafs this season, the Black and Gold won three of them and lost only one game. The Bruins outscored the Leafs 16-10 within those games, including a six-goal performance on December 8th. David Pastrnak scored six goals in four games versus Toronto by himself. Boston failed to score more than two goals in that series only one time, and it was the sole game that they lost. In that loss, Frederik Andersen stopped 38 of 40 shots against to seal the deal for Toronto. Each and every one of those games had a type of intensity and energy that is not as present when either team plays another team. The Bruins did take the season series this year, three games to one, but the Leafs can very well perform better or worse come playoff time, and the same can be said for the B’s. The Boston Bruins, on paper, win three of the four categories that I have listed here today. With that said, that can all essentially be thrown out the window once the puck drops to signify the start to Game One as both teams will gain a brand new intensity and momentum that the playoffs bring. If you are planning on making a wager on this series, I would recommend a prediction of seven games, at least. Either one of them can take the series at any given time, but with the experience of the past games dating back to 2017-18, these two Original Six franchises have so many glaring similarities and yet, differences. The question is, is will those differences be enough to win four games? That is the main goal for either club. It doesn’t stop there either. The Bruins have a tougher roster mentally, at least what has been shown this season and that will most definitely play a factor in who advances to the second round. Whether you are a Boston Bruins fan or a Toronto Maple Leafs fan, prepare for yet another nail-biting, entertaining, exciting matchup between the team we love to cheer for and the team we love to cheer against.